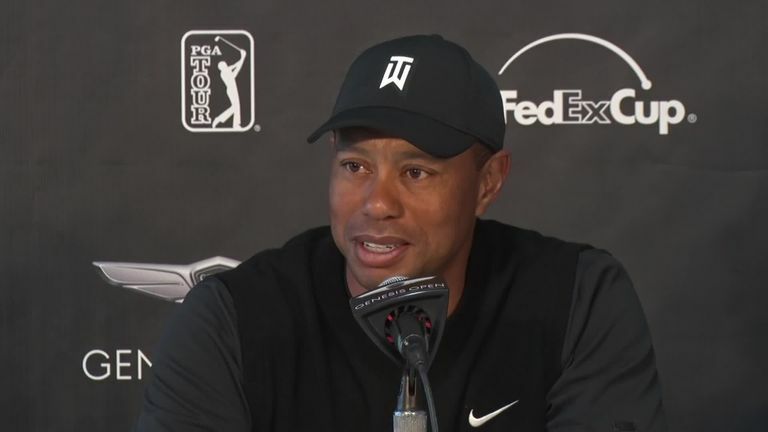 Tiger Woods compares his expectations this week to a year ago as he prepares for the Genesis Open at Riviera, a course on which he has yet to win on the PGA Tour. Tiger Woods goes into this week's Genesis Open with far higher expectations than last year as he bids to win at Riviera Country Club for the first time in his career. The historic course on the outskirts of Los Angeles is one of the few venues at which Woods has yet to notch a victory in 12 attempts, although he did go close 21 years ago when he lost out to Billy Mayfair in a play-off before also finishing runner-up to two-shot winner Ernie Els the following season. Woods missed the cut here last year in just his second full-field PGA Tour start after undergoing spinal fusion surgery, but he has high hopes of contending for his 81st career title on a course that remains one of his favourites despite his lack of success. "Last year at this time I just had competed in basically one Tour event, and I was just trying whether or not I can make it to Florida," said the 43-year-old at his pre-tournament press conference. "So I'm in a very different position now, having played an entire season - I know what my body can and can not do and so I'm looking forward to this week. "Hopefully I can finally play this golf course well. It's been a while. I had an opportunity against Ernie, when I was one back with one to go and I put it over there in some beer tent to the right. So hopefully I can do a little bit better this year." Woods, who confirmed he would be playing in next week's WGC-Mexico Championship, also insisted he embraced the challenge of playing alongside Rory McIlroy for the first two rounds. "I've always enjoyed playing with Rory," Woods added. "He's a great kid and we've got close over the years. I've always enjoyed watching him play, how he's developed and the amount of tournaments he's won and the majors and the margins he's won. "He is still learning and developing, so there are so many more wins ahead of him. But I've just enjoyed being a part of watching him mature on the Tour and getting to know him a lot closer." Woods also admitted he was spurred on by the recent success of long-time rival Phil Mickelson, whose superb, closing 65 earned the 48-year-old veteran an impressive three-stroke victory at the AT&T Pebble Beach Pro-Am - his first win on US Soil for over six years. "Phil has always pushed me," said Woods. "I remember talking to Arnold Palmer and Jack Nicklaus about this. For my entire career, and Phil can probably attest to this, we've always looked at the board and tried to figure out where one another is at. "So we've always had that type of enjoyment of competing against one another and to see what he's done or see what he did last year in Mexico, at 47 years old, gave me confidence that I could somehow do it maybe last year and I was able to finally culminate my season with a win just like he did earlier in the year." Woods then revealed he had turned down an invitation to join a star-studded field for the inaugural Saudi International, where Dustin Johnson emerged victorious two weeks ago, although he insisted that it was a logistical decision rather than humanitarian. He added: "I haven't really played a lot overseas and I turned down the invitation last summer, so it was well before anything had transpired. I just think it was travelling, I'm trying to keep the travelling down to a minimum and I am just focused on our Tour."